“EEEeee! 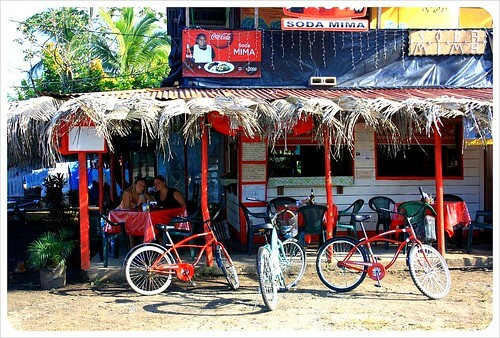 This is just like Eat Pray Love!” Jaime squealed as we pedaled away from the bike rental shop on our shiny new bikes to explore the Caribbean beaches of the Costa Rican coast. Cheesy as it sounds, I think we all found the experience to be liberating, exhilarating yet completely relaxing. We had just met Jaime, the Breakaway Backpacker, in person for the first time the day before in Puerto Viejo, and even though he had not ridden a bicycle for quite a while, he was up for a bike ride along Costa Rica’s Caribbean coast. Puerto Viejo itself is a fun town and has everything in terms of hotels, bars and restaurants, but the beaches in town pale in comparison to the spots further down the coast. Bikes are available throughout town for US$5 per day, complete with locks and a big basket to hold your beach gear, so we set off by bike along the well-paved coastal road in search of a spot to swim and soak up the sun. The road hugs the coast the whole 14km from Puerto Viejo to Manzanillo, weaving along from just on the coast to a bit more inland where a glimpse of the beach is only possible through the thick jungle. Although there are patches where potholes are plentiful, the vast majority of the road is absolutely perfect for bike riding, traffic (both bike and car) is minimal, making it possible for us to spend the way out of town chatting away. Other times we rode along in peace and quiet, each enjoying our own little moments of solitude with the sun shining down. 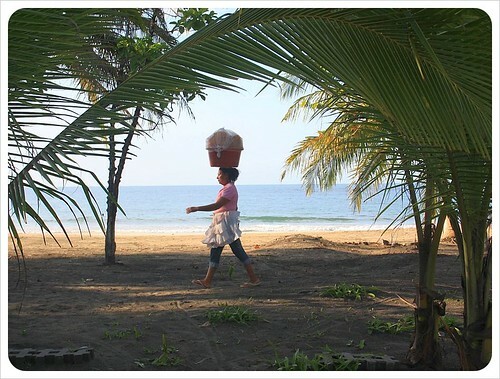 Just about a mile outside of town we reached Playa Cocles, and if we had stayed there all day we would have been more than satisfied. The waves here are strong, and we watched surfers and sipped fresh coconut water before heading to Punta Uva, a thirty minute ride further along the coast. From the minute we parked our bikes under the palm trees near the National Park sign, it was clear this beach was our absolute favorite. Beaches rarely get better than this. Set in a bay, the beach in protected by a tropical tree covered cliff which keeps the waves out and the water perfectly flat, nearly motionless. 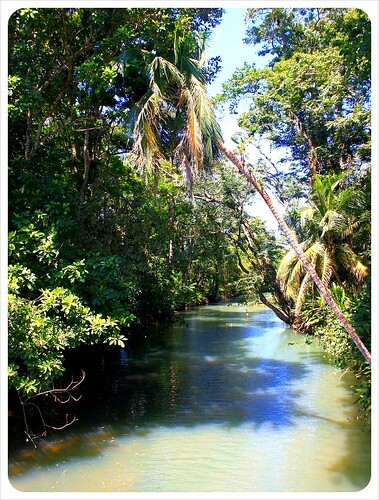 Looking back at the lush jungle while floating freely in the water was invigorating. Despite it being Saturday afternoon and cloud-free skies, we shared the entire beach with no more than 20 people. We could have stayed here all day, but instead convinced ourselves to take advantage of our fabulous bikes and move on to Manzanillo. 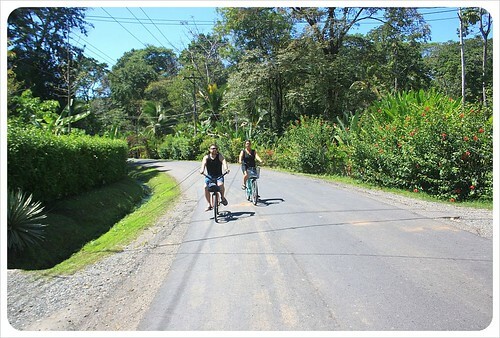 Whereas the first part of the road from Puerto Viejo to Punta Uva is lined with spacious hotel properties, a few resorts, high end restaurants, surf shops, and a smattering of cheapie mom and pop restaurants, the second half of the ride is almost entirely through the jungle. 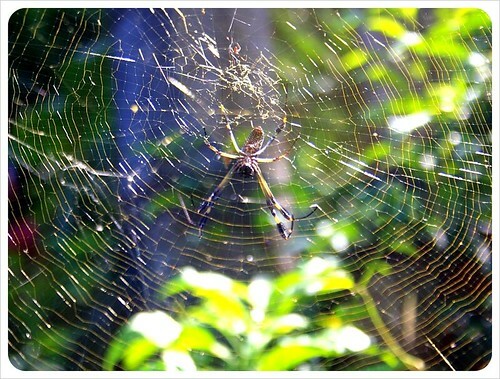 Along the way, we dismounted just off the road to goggle at hundreds of hand-size Golden Orb spiders hanging in webs that must have taken generations to build. On the way back, in exactly the same place, Jaime squealed a second time, but this time to warn me about the 5 foot long black snake slithering its way across the road. 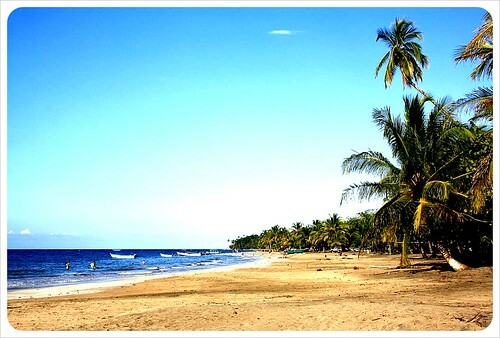 Manzanillo has the most Caribbean feeling of all the beaches. This cheerful, colorful little town is populated mainly by English-speaking Afro-Caribbeans living in smaller houses, some on stilts, plus a handful of bars, restaurants and hotels. The beach is as long and wide as the town is small – the sprawling sand stretches for miles, but we only had time here for a quick bite in the local soda (simple Costa Rican restaurant), before jumping back on the bike and power-pedalling those 14 hilly kilometres along the road through the jungle, past the spiders, around the snake, back toward Puerto Viejo before sunset. The road was ours, only passing the occasional car or bike, until we hit Playa Cocles again. Here, we joined a heavy flow of bicycle traffic all heading back to Puerto Viejo, at time five bicycles wide, as groups of tourists on Caribbean holidays joined surfers riding one-handed, clutching their boards under one arm after a day out on the waves. We returned the bikes 8 hours and 28km later, sunburnt, saddle sore and smiled the whole way back to the hostel. A truly life-affirming day indeed. 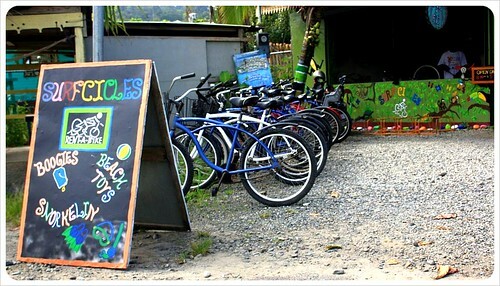 Sounds like so much fun- I really want to go to Costa Rica soon. It just seems like the perfect escape! 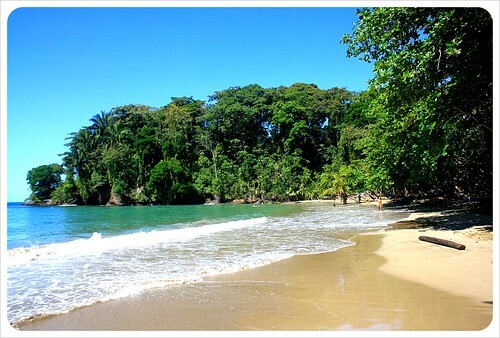 Hi Jade – Costa Rica really is a great escape for beaches and wildlife! We absolutely loved it! 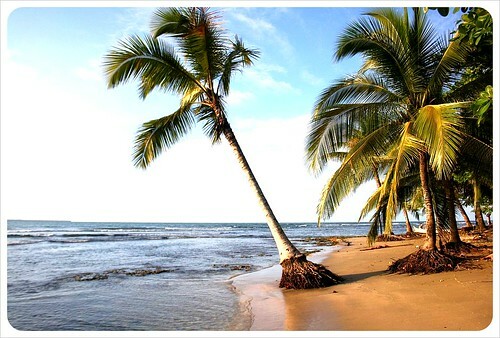 Got any suggestions as to what would be the best Costa Rican beach for little kids? I’ve heard that Punta Uva is great. I notice in the bike hire pic that one of the bikes even has a baby carrier on the back… great for us!!!! Two years later and I still remember this. I had to come back and share this article with some of my readers. I now post my fav photo of the round up from 2 years ago and a photo I took at Punta Uva is it. Check it out on my fanpage. Gosh I had a blast with y’all this day (the rest too). Jaime – we still remember that day as if it was yesterday 🙂 Punta Uva was amazing. It made us think ‘that’s how we picture Asian beaches’ and after having been to a few, it really does look like a South East Asia beach, don’t you agree? Miss you!